The Nanofiber analog interconnect signal path is as straight and clean as it gets: it is free of any kind of solder or crimp because it is composed of very thin conductive carbon fibers (nano-fibers) which directly transform into the center pins of the proprietary STEALTH RCA or XLR connectors at the ends of the cables; the connectors are actually integrated into the cables. There is absolutely no metal of any kind in the signal carrying part of these cables. The return (shield) however is made of metal (multiple thin OFC strands) in both RCA and XLR configurations, and because of that, the Nanofiber cables are as silent and hum-free as the best conventional - i.e. all metal - interconnects. The Nanofiber main strength is its exceptional midrange purity (we feel the midrange is absolutely as open as with the Indra - the flagship of STEALTH analog interconnects). The Nanofiber offers first class overall presentation: excellent speed, very good midbass and deep bass performance, sweet treble - but this sweet treble is not extended enough to qualify for the reference level - i.e. truly complete with the Indra when it comes to critical listening. 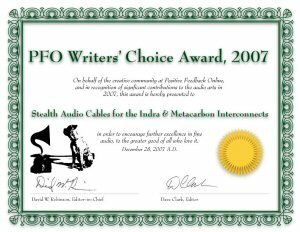 However, there is one area where the Nanofiber actually outperforms the Indra: these pure carbon cables offer the least "listening fatigue" of all cables we have ever tested (our own and other brands). In our opinion, the Nanofiber is the best choice for pure listening pleasure - all by itself, or in combination with the Indra or the Metacarbon. If you like the Quad ESL loudspeakers, then you are most likely to prefer the Nanofiber to any other cable. 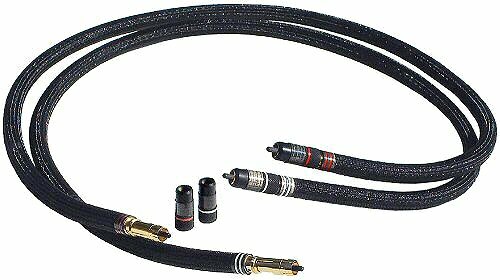 Suggested retail price for a 1 meter RCA-terminated Nanofiber pair is $2,600 ($1,500 for each consecutive meter), and $3,400 for a 1 meter balanced XLR pair ($2,000 for each consecutive meter). 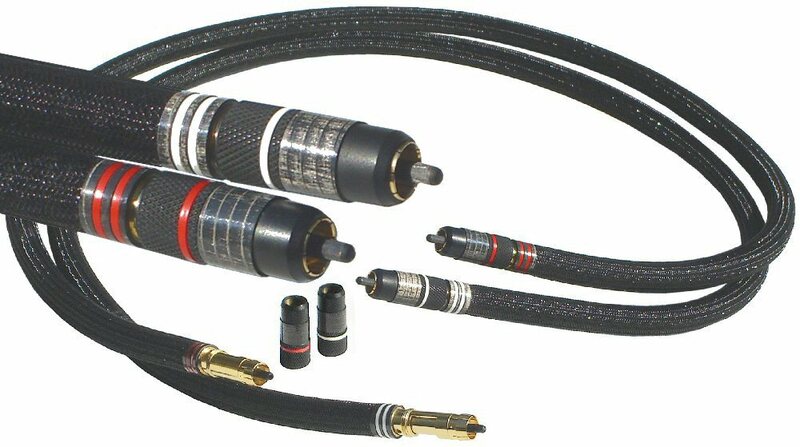 The RCA to RCA Nanofiber cables made prior to October 2006 looked as shown below (please note the spring loaded RCA connectors - i.e. NOT the locking connectors as on the current production Nanofiber cables; the cable construction and the RCA connector design principle are the same in both versions: the center RCA pins are carbon).